Democratic presidential candidate Beto O’Rourke would not sign a pledge presented to him by environmental activists in New Hampshire to not take contributions from coal, gas and oil companies. Activists with the New Hampshire Youth Movement posted a video on Twitter of O’Rourke declining to sign the group’s “No Fossil Fuel Money” pledge. The pledge asks candidates to reject donations of $200 or greater from fossil fuel companies, executives and affiliated PACs. So far, only five other Democratic 2020 hopefuls signed the “No Fossil Fuel Money” pledge, including New York Sen. Kirsten Gillibrand, Vermont Sen. Bernie Sanders, Massachusetts Sen. Elizabeth Warren, Hawaii Rep. Tulsi Gabbard and Washington Gov. Jay Inslee. On the other hand, 10 declared Democratic 2020 presidential candidates have not pledged to reject fossil fuel industry donations, including California Sen. Kamala Harris, New Jersey Sen. Cory Booker and Minnesota Sen. Amy Klobuchar. Environmentalists are trying to seize on the hype surrounding the Green New Deal to push their anti-fossil fuels pledge. The pledge, administered by a coalition led by the environmental group Oil Change, has been around for years and currently has more than 1,300 signatories. O’Rourke said he hadn’t “seen anything better” than the Green New Deal to address global warming. Democratic New York Rep. Alexandria Ocasio-Cortez’s resolution calls for a rapid move towards a “net-zero” greenhouse gas emissions economy as well as a host of welfare programs. 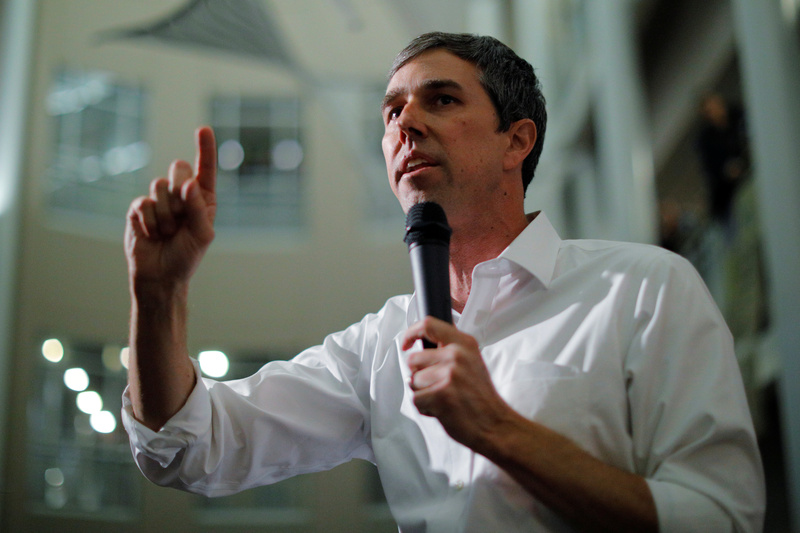 Democratic 2020 U.S. presidential candidate and former U.S. Representative Beto O’Rourke speaks at a campaign stop at Keene State College in Keene, New Hampshire, U.S., March 19, 2019. REUTERS/Brian Snyder. “Not only is it caused by our own excesses and inaction, but it is harming us, taking the lives of our fellow Americans and our fellow human beings all over the world, right now, as we stand together here in New Hampshire,” Beto said Tuesday night, WMUR 9 reported. Given his remarks, environmentalists were disappointed he didn’t sign the pledge. However, the success rate of “No Fossil Fuel Money” pledge signatories seeking federal office is less than stellar, according to election data. Of the more than 430 federal office-seekers who signed the “No Fossil Fuel Money Pledge,” only 28 won. Of those 28, 13 were incumbents.